Polymer films with transparent or opaque are known as specialty and high performance film. The basic raw materials for production of these films include polyesters, fluoropolymers and polycarbonates. Packaging, automotive, electrical & electronics, and construction are the major end-use industries of specialty and high performance films. These films are gaining major traction across industries, mainly due to their high resistance to chemicals, high tensile strength and high impact resistance. Growing demand for packaged and frozen food in developed countries, owing rampant growth of end-use industries is expected to provide growth impetus for the specialty and high performance film market during the forecasted period. Moreover, rising demand for disposable food and beverage packaging such as tetra pack products is projected to provide further traction for market growth. The primary focus of packaged food industry is to improve hygiene to protect the food from UV, sunlight, dust, temperature and air. Barrier films and UV control films are few products used in food and beverages industry. Moreover, it increases the life span of the food and helps to maintain the quality of food for a longer duration of time. Increasing population and growing urbanization in emerging economies such as China, India, Brazil, and Middle East is fueling leading to surge in construction activities in these regions. Increasing demand for improved and modern commercial complex and residential buildings with glass exterior is growing. Moreover, reconstruction and renovation activities in North America and Europe is expected to boost the specialty and high performance film market. For instance, due to global warming, UV rays protection is one the major challenges for modern glass buildings and complexes. Increasing use of UV rays and sunlight control film is forecasted to drive the film market as per study conducted by Coherent Market Insights. The global Specialty and High Performance Film market size is estimated at US$ 34.92 billion (revenue) and 10,999.25 kilo tons (volume) in 2016 and is expected to expand at a CAGR of 6.5% in terms of revenue and 5.8% in terms of volume during the period 2017 – 2025. 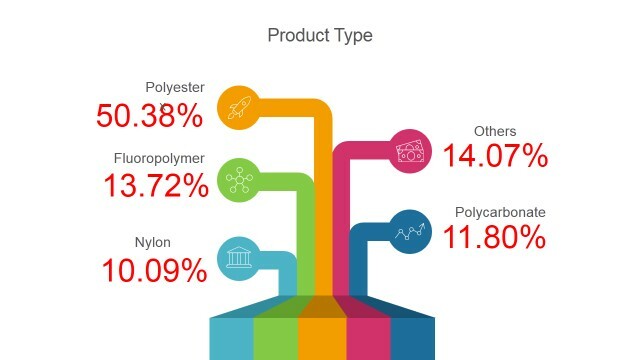 Among application, polycarbonate segment accounted for the largest market share in 2016. Asia Pacific is the largest market and is expected to witness a CAGR of 7.4% in terms of volume over the forecast period. High glass transition temperature, high impact resistance, and superior durability are the primary characteristics of polycarbonate polymer film. Polycarbonate polymer films find applications in construction materials, electronic components, automotive, and aircrafts among others. The demand for polycarbonate films is expected to increase by the packaging and transporting of doors & window frames and aircraft components. Increasing population in Asia Pacific, increasing construction and renovation activities in emerging and developed economies, and increasing automotive industries are expected to drive the specialty and high performance film market growth over the forecast period. Asia Pacific, followed by Europe and North America accounted for major share in the global specialty and high performance film market both in terms of revenue and volume in 2016 and the trend is estimated to remain the same over the forecast period. In 2016, Asia Pacific held a share of 39.58% in terms of volume, followed by Europe (25.24%). According to a study conducted by Coherent Market Insights, the global construction market is expected to witness a CAGR of 7.6% from 2017 to 2025 which is expected to create a highly conducive environment for growth of the global specialty and high performance film market. Major players in the global specialty and high performance film market include The Dow Chemicals Company, E. I. du Pont de Nemours, Bayer AG, Bemis Company Inc., Evonik Industries, Honeywell International Inc., Eastman Chemical Company, Sealed Air Corporation, The 3M Company, DuPont, among others. In 2012, Eastman Chemical Company and Solutia collaborated to expand Solutia photovoltaic segments. Polymer films with transparent or opaque are known as specialty and high performance films. The basic raw materials for production of specialty and high performance films include polyesters, fluoropolymers, and polycarbonates. High chemical resistance and excellent mechanical strength fuel demand for specialty and high performance film. The specialty and high performance film market is expected to expand at a CAGR of 6.5%, in terms of revenue from 2017–2025. Rampant growth of construction, packaging, automotive, and food & beverage end-use industries in both developed and emerging economies creates a conductive environment for growth of the specialty and high performance films market. Among product types, polyester film segment accounts for major share in the market, while polycarbonate segment is expected to witness significant growth over 2017-2025. Stringent government regulations and increasing environmental concern is expected to be one of the key challenges for specialty and high performance films. Moreover, rapid investment in R&D to develop biodegradable products such as paper & cardboard, corn starch, bubble wrap, and biodegradable plastics is expected to create new opportunities for players in the global specialty and high performance films market. For instance, in July 13, 2016, AIMPLAS developed a new biodegradable packaging for cheese and pasta, at an investment of US$ 1.63 million. The last decade has witnessed a steady rise in global awareness about cutting down on carbon emissions. This in turn has led to heightened awareness among the general populace and governments alike towards adoption of greener and renewable sources of energy. Solar energy being the most widely available and feasible source of energy, has led to rampant growth f other solar energy industry. Specialty and high performance films are used in photovoltaic cell used in solar systems. Stringent environmental regulations, for instance in 2005, EPA implemented policy to lower the airborne mercury up to 7% by 2018, from coal fired power plant. Moreover with increasing consumer inclination towards off-grid power solutions is fueling growth of the solar energy industry. This in turns creates a highly favorable growth scenario for the global specialty and high performance films market. Furthermore, volatility of crude oil price has a positive impact on renewable energy sources, which is expected to fuel growth of the electronics and semiconductors industry. Increasing urbanization and mall culture in cities is in turn leading to burgeoning growth in owing the demand for packaged and disposable food products. This creates high demand for meat packaging and vacuum packaging, which would fuel growth of the barrier films segment in the market. Moreover, the growing demand for specialty and high performance film in automotive industry to protect sunroof, windows, windshields, and dashboard is expected to augment market growth. Rising construction and renovation activities in developing countries includes China, India and Brazil is augmenting the market growth. Rapid urbanization owing the demand for specialty and high performance film in the construction sector which includes to protect the buildings from sunlight, UV, and safety & security is propelling the market growth. Moreover, North America and Europe are projected to witness growth in the construction sector, due to continuously increasing infrastructure renovation activities in the region. These factors would collectively support growth of the market. The report takes into account the various products of specialty and high performance films includes polyester, nylon, fluropolymer, polycarbonate, and analyzing the market value and growth (%) during the forecast period. Key companies covered as a part of this study include The Dow Chemicals Company, E.I. DuPont De Nemours, Bayer AG, Bemis Company Inc., Evonik Industries, Honeywell International Inc., Eastman Chemical Company, Sealed Air Corporation, and The 3M Company, among others. *Browse 90 market data tables and 40 figures on "Specialty and High Performance Film Market - Global forecast to 2025”.